ERP software in Bahrain from Coral Business Solutions , one of the top ERP software in UAE and Bahrain. A complete VAT enabled ERP Software, for the companies of any size and activity in Middle East. Our erp software automates and integrates all divisions of business and facilitates its smooth functioning. ERP software is a list of efficient procedures or practices which a company can easily adapt to reduce the cost of operation and to achieve the desired level of profitability. 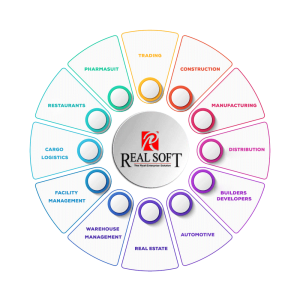 RealSoft ERP software solutions cover all major industry verticals such as retail, manufacturing, trading, warehousing & logistics, real estate & construction, fleet management, distribution, automobiles, production, service establishments and healthcare. ERP Software have also played an important role in automating business in Bahrain. Bahrain had the first post-oil economy in the Persian Gulf. Since the late 20th century, Bahrain has invested in the banking and tourism sectors. The other major economic activities in Bahrain are petroleum processing and refining, aluminum production, hospitality, retail, construction, natural gas. A complete ERP solution that provides your employees with exactly the functions and information they need. A complete business-management software that helps your industry success. Our erp software system is highly flexible according to customer needs, feasible solution, and affordable. We have 16+ years of experience in UAE and have office in Bahrain, our range includes software to manage your business finances, run the payroll, manage customer and supplier relationships, plan the business and support your HR function. We offer all IT solutions Bahrain, provider of hardware, software and service solutions. Office 35, Building 2304, Road 2830, Block 428, Al Seef, Manama, Bahrain.